Josh Pfister began as our part-time shop manager in fall 2016. 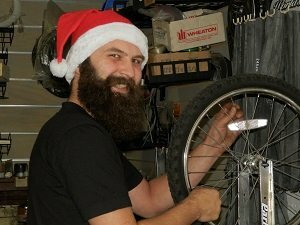 Josh had been a long-time volunteer with Sharing Wheels, and has worked at the Marysville Bike Shop and at Bicycle Centres in Everett. He is extremely knowledgeable about bikes – classic and current – it helps that he rides one every day (but which one?). As shop manager, Josh oversees daily shop operations, ensures quality repairs and provides outstanding customer service – he will help you find the right bike for your needs. Sarah Molitch is a former board member who has been a long-time volunteer with Sharing Wheels who has coordinated the Kids Bike Swap and organized music fund raisers for the shop. In addition to working part-time with us, Sarah is the art director at Jag Artworks, an art conservator and an artist in her own right. She owns many bikes and gets around most often on a Trek she fixed up at Sharing Wheels. She also has a dog and a son in high school. Kristin is a communications consultant who formerly coordinated local Bike to Work events and created the Snohomish County Bike Map for Community Transit. She is the current president of B.I.K.E.S. Club of Snohomish County, and former president of the statewide Bicycle Alliance of Washington (now Washington Bikes). Before joining the board in 2015, Kristin was passingly involved with all types of Sharing Wheels activities, mostly through her wife Kristi Knodell, the volunteer shop manager for many years. As a board member and current board president, she hopes the shop can continue its mission of providing community tools and shop space while growing into a more robust organization that remains focused on our niche – providing affordable used bikes and parts for transportation and recreation. Tom joined the board in 2015. He has served as the treasurer and is currently the vice president. He retired to Snohomish after working as the Director of New Technology for Paccar and was elected to serve on the Snohomish City Council in 2017. He appreciates that Sharing Wheels offers affordable bikes to people for “transportation, exercise and joy.” He brings strategic planning, financial and management experience to the board, as well as great community connections and forward-thinking. Steve joined the board at the beginning of 2017 and now serves as board treasurer. Steve is a retired airline pilot who continues to travel the world, now on his own schedule. As a board member, he has reached out to the Everett community to talk about the mission and needs of Sharing Wheels – focusing on service clubs such as Rotary, Lions, VFW, etc. Steve has previous experience as a board member at a small suburban library in Illinois, and served on a Church Board of Trustees in the same town. Steve earned his cycling Merit Badge in Boy Scouts, and has helped others do the same as an Assistant Scout Master. He has been an avid cyclist since acquiring his first 10-speed as a college student. For Steve, bicycling is his ‘Happy Place’, but he also recognizes many people cycle for basic transportation and he strongly supports our mission to serve low income people. Steve has been married for 37 years and has 2 grown children. Born and raised in Everett, Scott joined the board in 2018 and serves as Treasurer and on the Shop Operations Committee. The son of two Everett raised residents, he brings to the organization his 8 years industry experience working for companies like Gregg’s Cycles, B&L Bicycles and Specialized Bicycle Components. Building on his deeply rooted passion for bicycles, he developed a strong appreciation for all things mechanical and went on to study Mechanical Engineering at Washington State University. Chasing after his love of excellent riding he now lives and works in Bellingham but, utilizes Sharing Wheels as a way to help develop his hometown into what he knows it can be. He believes deeply in the opportunities bicycles offer humanity, and he aims to share his passion to help more people get excited about bikes. Drew has retired from his work owning and managing companies in the seafood business and turned to bicycling as his full time passion. He is an active member of B.I.K.E.S. Club of Snohomish County, works part-time at Gregg’s Cycle in Lynnwood, and joined the Sharing Wheels board in fall 2018. Ideal candidates have demonstrated a passion for bicycles or community-building, and have participated in significant ways in other nonprofit or service organizations.